Forget everything you know about neckplates with graphics….’cause we have re-invented them!! 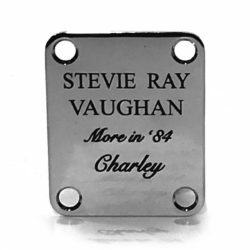 Everyone is familiar with the typical laser engraved neckplates that are only available in black and white. We have come up with a solution and designed a process that actually impregnates the surface of the neckplates with a durable graphic….in FULL COLOR!! Screws are also included. You upload / email us your image or artwork (The better the picture, the better the end result. 300DPI resolution or higher is preferred. We make it!! Its that easy!!! **** ALL ARTWORK SUBMITTED SHOULD BE READY TO USE. ONE CHANGE IS FREE OF CHARGE. ANY ADDITIONAL CHANGES WILL BE AN EXTRA CHARGE. **** FULL CUSTOM PLATES CAN BE DESIGNED. PLEASE CONTACT US FIRST FOR MORE INFORMATION. We have ordered several pick-guards and back-plates from Axetreme, some standard and some highly custom. The quality and workmanship is top notch. Customer service and attention to detail is even better. The pickguard and control covers for our Air Force Bass required custom shapes, custom designs and custom colors. Nick and the production team worked together to produce a product to our exact specs and offered a few ideas of their own to make the end result even better. One of those ideas was to do a color version of our standard logo neck plate. it looks great coordinated with the rest of the bass. AMAZING custom printed plate from my own design! It really is inside the metal! I just got my Full Color Custom Neck Plate back and it looks stellar, its perfect I sent them my art work and Nick, was great I was afraid the design might not fit on the plate the way I had wanted but Nick, got it exactly the way I wanted it. Anyway I can’t thank you and your company enough this neck plate is the final touch on my custom Charvel San Dimas guitar. And the other Aged parts I purchased for my Aged Voodoo Strat looks fantastic. Anyone looking for some cool parts for your guitar check these guys out. Thanks for the great work you guys did on my custom neck plate. I look forward to doing more business in the future.